If you’ve had freestanding closets for what seems like forever and you’ve never felt that they’ve been the best solution for your storage needs, it is worth considering investing in a walk-in closet. In recent years the popularity of walk-in closets in Toronto has risen sharply (we’ve been going since 1991 and walk-in closets are now more popular than ever before!) and are now seen as a “must have” feature for the thousands of home seekers that are trying to find their ideal property in the GTA at any one time. But just why are they so much more desirable than a freestanding unit? If you’re currently looking to purchase a new closet, but are not quite sure which option you should put your faith (and money) in, then continue reading as we’re going to compare walk-in closets to freestanding units during this article. Walk-In Closets: Are They a Superior Storage Solution? Walk-in closets are not the best solution for everyone and it’s important to sit down and compare them to their freestanding counterparts from several different perspectives. Space Available – A common complaint of freestanding closets is that they can take up a significant amount of space in a room and force you to change the layout of the room from how you would ideally like it. You don’t have the same problem with walk-in closets however, since they don’t actually take up any space in the room; they are safely tucked away and out of sight. Storage Efficiency – No matter how big the freestanding closet is that you buy, it always seems to fill up pretty quickly. It’s not long before your clothing is being squashed together, which can cause it to smell and become creased. 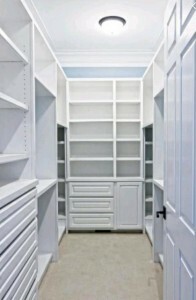 That’s obviously not ideal and walk-in closets can eliminate this issue, as every item that you need storing is allocated its own space and is allowed to “breathe.” Not only are walk-in closets more efficient in terms of the layout of the room not being affected, but they offer more space inside too. Level of Organization – A disorganised closet can be the worst thing in the world, especially when you’re in a hurry, and it’s very easy for a freestanding closet to become disorganized as a result of the lack of interior space that we just mentioned. In a walk-in closet however, everything is allocated a specific section of the closet, is easy to spot and can be grabbed in just a couple of seconds. Much better than minutes of fumbling around in a freestanding unit to find the shirt that you want. Safety Aspect – One feature that many client in Toronto have asked us to integrate into the design of walk in closets is a safe. Safes can be carefully hidden in these closets and are used to store a range of possessions from important personal documents to valuable items. While you could have a safe fitted in a freestanding unit, the fact that the closet is actually in the room increases the chances that a burglar will “check it out” and maybe find the safe. Privacy – Another thing that walk-in closets can offer you that freestanding closets can’t is privacy. Walk-in closets can double up as a changing room, meaning you can get changed in peace even if someone is in your bedroom. 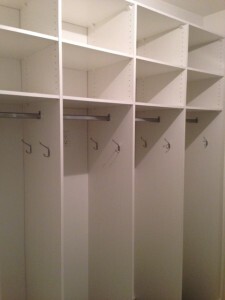 Superior Closets’ main priority is to ensure that you end up with the best storage solution for your situation. Sometimes walk-in closets are the best choice, while on other occasion custom closets (whether built-in or freestanding) make more sense. Call us today to arrange a free onsite consultation, during which we will listen to your needs, preferences and evaluate the space where the closet will be installed, before providing you with a recommendation based on our 24 years of industry experience. As you have most probably become increasingly aware during your adult life, cabinets are an essential feature of the home and something that we simply couldn’t live without. If our homes didn’t have cabinets they would be a dysfunctional mess since their primary role is that of storage. Take a moment to think just how many items in your home are currently stored in cabinets. Can you imagine all of those items being simply laid out on the floor or piled in top of one another on your bed or sofa? It would be an absolute nightmare. However, they are not just a functional piece of furniture. Due to their prominence in most rooms, they also contribute to the appearance of the interior of your home considerably. When it comes time to replace worn cabinets or you need to select cabinets for a newly built home, many people instantly visit the website of a big box store or pick up the car keys to go and browse their selection of cabinets in person. However, there is a much better solution! Custom cabinets are far superior to those that are sold in big box stores and are something that we’ve been producing for homeowners in the Toronto area for close to 25 years. But just why are custom cabinets a better investment than store bought cabinets? Higher Quality Materials Used – The first thing to realise is that the materials used to produce the cabinets sold in big box stores aren’t worth anywhere near the money that you actually pay, and as a result of these sub-par materials being used, the longevity of your new cabinets is seriously affected. Most store bought cabinets are constructed using low quality particle board that isn’t capable of standing up to the rigors of daily use, meaning you will likely have to completely replace your cabinets in just a few years. Contrastingly, custom cabinets are typically constructed from solid hardwoods, with higher quality joints used to connect the various pieces (dovetail and mortise and tenon joints are common), meaning that you can enjoy using your cabinets for decades without worrying about the door falling off or the cabinet collapsing. Tailored to Your Needs – Store bought cabinets aren’t made for you and that’s one of the big advantages that custom cabinets are able to offer you. When designing custom cabinets for your home, we take into account what will be stored in the cabinets and who will be using them, therefore perfectly matching their design with your exact requirements and preferences. Why buy cabinets that are bigger than you really need or cabinets that have a layout that you find awkward to use? Integrate Into Your Home Effortlessly – As well as taking your requirements into consideration, we also carefully analyse the environment that the cabinets need to integrate into and come up with a design, colour and finish that does this effortlessly. When buying ready-made cabinets you are limited in terms of the designs that are available and you might not be able to find the perfect solution. With custom cabinets however, this is a given and the only limiting factor is your imagination. Made to Measure – Not all rooms have a regular shape or layout and sometimes it can be difficult to find a ready-made solution that will fit. You may have to compromise and choose a cabinet that leaves ugly gaps showing. Custom cabinets are tailored to the exact dimensions of your room however and are guaranteed to fit perfectly. There is simply no comparison between custom cabinets and store bought solutions, and even the single advantage that the latter does offer (lower upfront cost) is irrelevant since you will probably have to buy three of four sets of cabinets to match the lifespan of one set of custom cabinets. If you are interested in any of our storage solutions, whether it be custom cabinets, custom closets or walk-in closets get in touch with our Toronto based team.